The Erasmus Mundus Fatima Al Fihri Programme (EMA2-STRAND 1, LOT 1) is a Partnership between 20 Universities from North Africa (Algeria, Morocco, Tunisia, Egypt and Libya) and from Europe (Belgium, France, Germany, Italy, Luxembourg, the Netherlands, Portugal and Spain). The consortium has the support of associated institutions mainly in North Africa such as Ministries of Higher Education, governmental institutions, associations of universities and youth organizations. This partnership has been done within the framework of the Erasmus Mundus Action 2 Strand 1 Lot 1. The Erasmus Mundus Fatima Al Fihri is grant programme to carry out academic activities in North Africa and in Europe. 1. Must be a NATIONAL of one of the third-countries: Algeria, Morocco, Tunisia, Egypt or Libya. Target Group 1 - Are nationals of North Africa (Algeria, Morocco, Tunisia, Egypt and Libya) who are registered or work in one of the third-country HEIs member of the partnership at the time of submitting their application to the partnership. Have obtained a university degree or equivalent by an institution of these countries (students only). This includes the possibility of providing mobility opportunities to third-country nationals working in public administration, public and private enterprises and non-profit organizations. Target Group 3 - Nationals North Africa (Algeria, Morocco, Tunisia, Egypt and Libya) concerned by the geographical lot who are in particularly vulnerable situations, for social and political reasons. 3. Must have NOT RESIDED NOR HAVE CARRIED OUT THEIR MAIN ACTIVITY (studies, work, etc) FOR MORE THAN A TOTAL OF 12 MONTHS OVER THE LAST FIVE YEARS in any of the eligible European countries at the time of submitting their application to the partnership. (This rule does not apply to Target group 3 candidates). 4. Proof of language level required by the host university. Please note that undergraduate students must have successfully completed at least one year of studies in their home institution at first higher education level. 20 Higher Education Institutions (HEIs) from 5 North African countries (Algeria, Morocco, Tunisia, Egypt and Libya) and 9 HEIs from 8 European countries (Belgium, France, Germany, Italy, Luxembourg, Netherlands, Portugal and Spain). See the complete list of Participating Institutions. The EMA2-STRAND1 Fatima Al-Fihri programme operates in all fields of study. Nevertheless you will find the academic programmes available in the universities of the partnership. To see the academic offer per university please visit the FIELDS OF STUDY section of the official website (link to it is below). Please note that in order to be an eligible candidate, you must have not resided nor have carried out your main activity (studies, work, etc) for more than a total of 12 months over the last five years in one of the European countries. (This rule does not apply to Target group 3 candidates). In order to complete your application correctly, please read the Online Application Instructions found on the official website carefully. Please, remember to fill in the online form in English. All applicants must fulfill the requirements established in the WHO CAN PARTICIPATE section of the official website, according to North African students and staff (see 'Eligibility' above) or European students and staff. 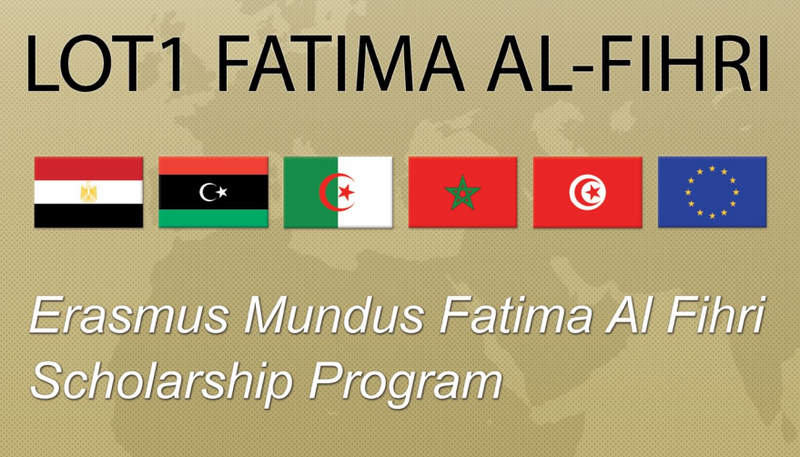 You can Apply Now for the Erasmus Mundus Fatima Al Fihri Scholarship. No student and no academic staff member can benefit from more than one mobility activity within the same project. Mobility must take place from North Africa (Algeria, Morocco, Tunisia, Egypt and Libya) to Europe or vice versa. The Erasmus Mundus is a cooperation and mobility program in the field of higher education that aims to enhance the quality of higher education and to promote dialogue and understanding between people and cultures through cooperation between Europe and Third-Countries. To contribute towards the development of human resources and the international co-operation capacity of higher education institutions in third-countries through increased mobility streams between the EU and third-countries in accordance with the principles of equal opportunities and non-discrimination. Fatima al Fihri was born in Tunisia in 800. At a young age, she moved with her family to Fez, Morocco. In 859 Fatima founded the world’s first academic degree-granting university existing today, the University of Qarawiyyin, which is considered the oldest university in the world. The University of Qarawiyyin became the most important cultural and intellectual bridge for Muslim and European cultures. Many of the scholars of Qarawiyyin became great scientists such as Mohammed al Idriss and Ibn Khaldoun. Her name represents sustainability, the women contribution to the knowledge society, a bridge between different cultures through education and a tribute to, now at days, a rather unknown Arabic woman who played a crucial role in the Islamic Golden Age.